How to get your music on services like iTunes, Spotify, Amazon etc.? Check out Record Union – Use my A&R code and get FREE promotion! You don’t need a record label to get your music available on digital media services like iTunes, Amazon, Spotify, Google Play…just to name a few. 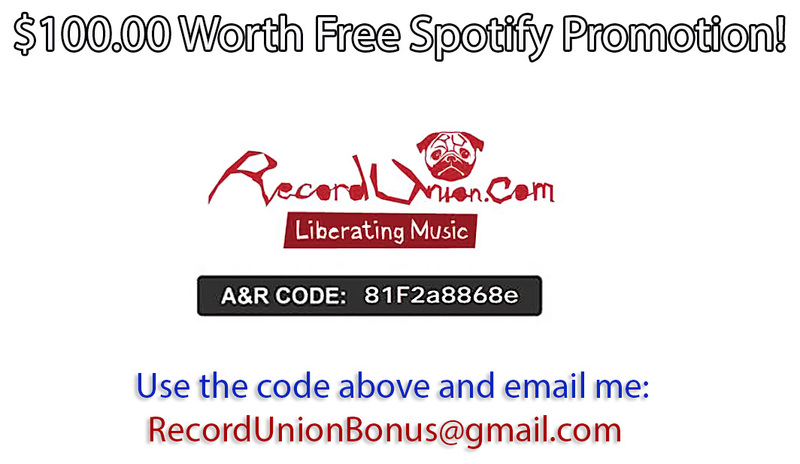 When you use my Record Union A&R code: 81F2a8868e – You’ll get 2 FREE UPC codes! Every release requires an UPC code, and some services ask high price for those (CD Baby asks $20.00 for each code!). That’s not all! When your music is available on Spotify. Just send me a message, and I will promote your music for free (only if you use my A&R code!). Promotion package is worth well over 100 dollars! You can follow your success on Record Union’s site. They also have a great Spotify tool, called Spotify Trends. Registering to Record Union site is free. Just remember to add the A&R coupon 81F2a8868e while you join. You can’t add it later!